A royal couple, a Seattle Camera Club and an admired photographer all have visited the Giant Cedar Stump near Arlington. SURELY SOME — maybe many — Pacific NW readers will remember this magazine’s predecessor, The Seattle Sunday Times Rotogravure. That weekend supplement covered regional stories that were illustrated — often lavishly — with sepia-toned photographs. Soon after the royals and the clubbies visited the stump, Boyd Ellis, Arlington’s popular postcard purveyor, recorded the historical photo in 1940. 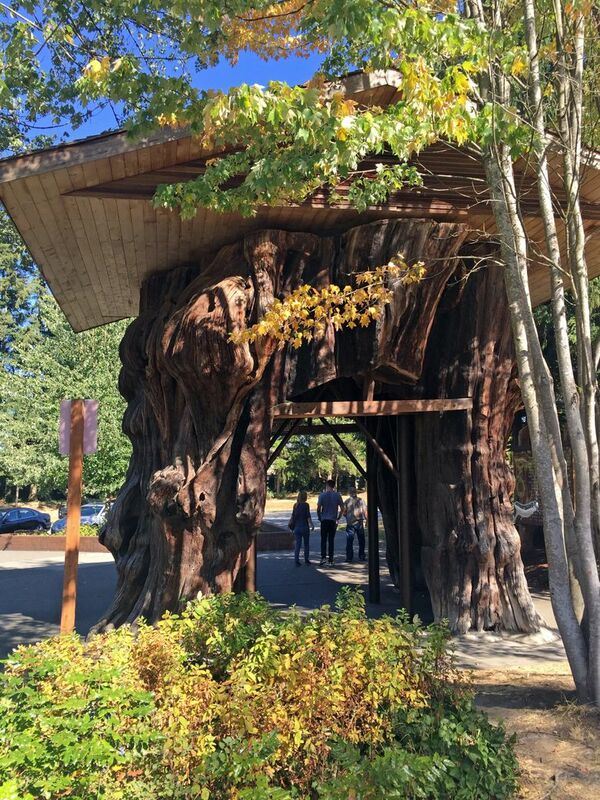 In his decades of exploring the Northwest for marketable snapshots of landmarks and other roadside attractions, Ellis snapped at least a dozen exposures of this Giant Cedar Stump. Our “then” photo is one of at least two stump portraits he took, posing the same auto (perhaps his). More to the point of the Giant Cedar Stump’s heritage, the 1,000-plus-year-old artifact has been associated with Arlington since the late 19th century, when that town was abuzz with mills. The stump is about 3½ miles from Arlington as the crow flies. The highway department moved the stump here, its last home, in 1971. 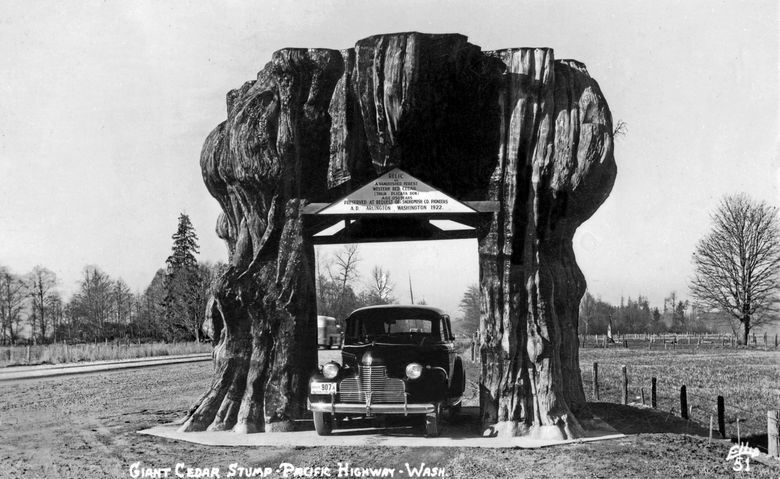 I will brag some by noting that I first stumbled upon the stump, and without injury, in the late 1960s, when it was still beside the highway, about one mile north of the Smokey Point Rest Area. I was headed for Vancouver and pulled over.